Despite passing away from cancer at the young age of 57, 80s icon Patrick Swayze kept acting up until the time of his death, appearing in a handful of movies and starring in the A&E drama The Beast. His untimely demise came in 2009, the same year Zombieland stormed theaters. And as it turns out, Patrick Swayze was actually supposed to play himself in that movie. This, unfortunately, didn't came to pass. As Zombieland fans know, it was Bill Murray that would go onto assume the role of himself, playing a heightened version of his Hollywood persona. The cameo remained a secret, even weeks after the movie came out, and many sight the former SNL and Ghostbusters star's presence in the movie as one of the highlights. In this horror action comedy, Woody Harrelson's Tallahassee and his survivor friends played by Jesse Eisenberg, Emma Stone and Abigail Breslin decided to visit Murray's estate just for fun. To their surprise, they discover Murray has been disguising himself as a zombie and is still alive. In a clip from this week's episode of AMC's Geeking Out with Kevin Smith, writers Rhett Reese and Paul Wernick, who are currently hard at work on scripting Deadpool 2, revealed that this big cameo scene was always intended for Patrick Swayze. Unfortunately, in the months leading up to the Zombieland shoot, Swayze became unable to work due to his illness from pancreatic cancer. Knowing they still wanted to bring in a big name cameo, Bill Murray was not the immediate next choice on their list. One other person they considered was Jean-Claude Van Damme. It was Woody Harrelson who suggested Bill Murray. The pair had worked together in the Farrelly Brothers comedy Kingpin. And it was the friendship that Harrelson and Murray formed on that set that convinced Murray to do Zombieland, as he is notoriously choosey when it comes to the projects he decides to actually show up for. 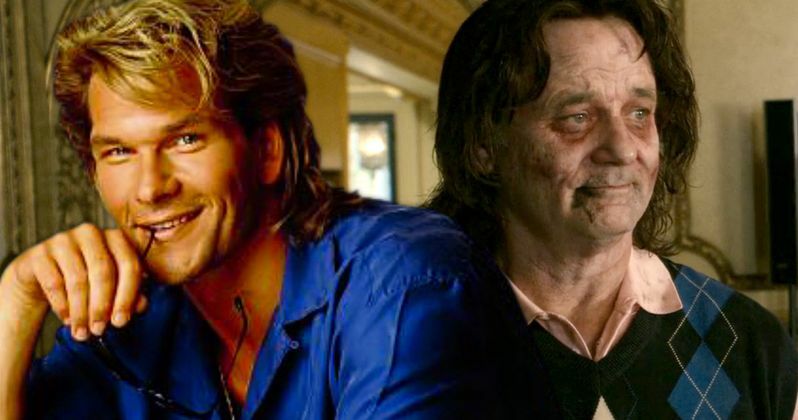 We're not sure how different Patrick Swayze's Zombieland cameo would have been. In the finished movie, Murray busts out his old Ghostbusters costume. Would the alternate version have seen Swayze doing something similar? Perhaps putting back on his costume from Dirty Dancing, or his President Mask from Point Break? This episode of Geeking Out airs on AMC tonight after Fear the Walking Dead. You can see the clip in question here. Zombieland 2 is rumored to begin shooting soon. It isn't known if the Zombieland team will shoot for another big cameo.